Since the beginning of May 2018, the MMOC website has had a little over four hundred support requests. I know, because all of them have come to me. There's a fairly large handful of spam from people offering to improve the rating of our website, or to give me several million pounds if only I'll give them my bank details, and adverts for some distinctly odd pills, but once those are sifted out we're left with an average of two requests every single day for support from members. And comfortably over 90% of those requests are issues relating to Logging In. So it's no surprise then that I've set up this page to try and deflect some of the Logging In support requests. If even half of the people needing help use this page to help themselves, I'll have a lot more time for the issues that are more complex. 'Joining'/Registration Logging In/Out Issues Why isn't the board doing X correctly? First things first - you do not need to register for the message board in order to view it. You're able to read 'threads' (conversations) without any form of registration (joining), and can even search for threads that interest you. However, if you want to 'interact' with the board, i.e. create your own thread, or write a reply on someone else's, or have the board send you an email when there is a reply on a thread you're following, then you'll need to register. It is currently MMOC policy that you do not need to be a member of the MMOC in order to join the messageboard. Registration is simple and straightforward, but you'd be surprised at how many people don't manage it. You don't have an account 'automatically' just because you're an MMOC member. If you haven't created an account on the board then you don't have one! If you've not already got an account, simply click the 'Register' link near the top right corner of the page, and agree to the terms and conditions, and then you'll be presented with the short form shown below. The animation will show you what to do in case you're stuck, but it should be self-explanatory. Once you've clicked Submit, just hang on until your account is authorised, which will usually be a handful of days. You'll receive an automated email at the address you filled in on the form, and you'll then be able to post messages etc when you use the messageboard. 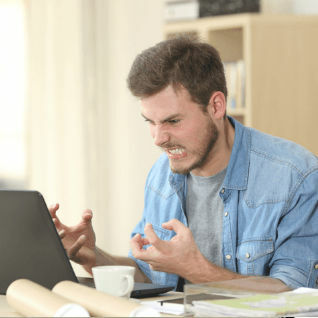 Be aware that your computer and/or the messageboard itself will automatically log you out on occasion and that you'll need to log back in again. This is a security feature of your browser and has nothing to do with the MMOC! My apologies for the faintly condescending image above, but you simply wouldn't believe the percentage of support requests that eventually turn out to be nothing more than a member attempting to use his MMOC login to access the messageboard or vice versa. The two logins are to completely independent areas of the MMOC website, and cannot be transposed! We are regularly asked if we can make them both the same, and unfortunately that's not possible since we only have a username to identify messageboard members and no other data was requested when those people joined the board. So, as long as the page you're attempting to log in at looks like the one on the left of the image above, you're good to go. Enter the username and password you chose when you joined up in the two boxes (remember that these are CaSe SEnsITivE). Keep a note of your password, because you cannot get a reminder of it. However, if you have forgotten your password you can get an automatic replacement of it, by clicking the 'forgotten password' text beneath the field. Then enter your username and/or your email address and click Submit and a new temporary password will be emailed to your registered email address. Please use the temporary password straight away or it will time out, and you will need to click the 'forgot password' link and start again. If you no longer have access to the email address you used when you registered, you will not be able to recover your username if you forget your password. No offence, but I don't know who you are, and I'm not going to give access to someone's username to a person who I cannot verify should have it. The two tickboxes on this login page are optional - if you put a tick in the top one, the board will 'remember you' next time you visit and you won't need to log in again. This won't last forever though, and you will still need to log in fairly regularly, just not as often as you would if you left it unticked. Obviously you shouldn't tick this box if you're using a 'shared' computer. The other tickbox allows you to not have your username listed at the foot of messageboard pages, so nobody else online can see that you're reading the board. Why has my post been deleted? A small team of moderators keep an eye on the board and ensure that posts do not contravene the T&C of posting. If your post has been removed, it is likely that it has broken those rules. I only want to sell my old engine/wings/seats/spaniel. Why do I have to register? Because that's how the board works - you need to register to post. No, I can't post it for you, if you want to sell your item, register - it takes just a few moments! Please Read The Members Area and the Messageboard are not the same thing. You can't use your messageboard login details to access the Members Area - it won't work. Every single day, without fail, people email me to say that their login information doesn't work, and it eventually transpires they are using their messageboard details to try to access the Members Area, or vice versa. If you cannot log in, please check that you are using the correct login details for the page you are on before contacting me for support! The MMOC maintains a small area of the website which is exclusively for paid up members of the MMMOC. This area is accessible from the Login link at the top right of any page of the MMOC website EXCEPT the messageboard. Once you have created an MMOC account you can use it to become a member of the club, or to renew your membership, make purchases from the online shop, maintain your virtual garage, etc. If you have already created an MMOC account in the past (NOT a messageboard account), but do not remember your registration details, please do not create a new account - just contact the club HQ on 01332 291675 and one of the staff will help you. 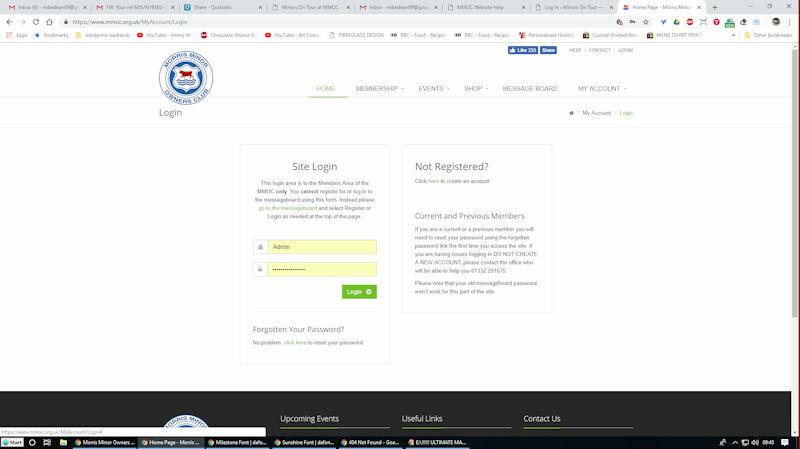 Please note that you do not automatically have an online account simply because you are a current member of the MMOC, and if you have never created one then you will not be able to access the Members Area content until you create an account. If you still have a problem, please get in touch with one of the addresses below and we will do our best to help. Regardless of who you are contacting, please think carefully about your request before hitting the send button. "I can't log in" isn't going to give the person looking at your mail many clues as to the problem, and all they can do is write back and ask you to provide more information, which will delay getting your issue sorted and take up valuable time for the person answering you. Please describe your problem fully, including whatever page you were on when the problem occurred. As above, please make sure you are entering the correct details on the correct form - if you are trying to log into the Members Area and are being asked for a 'username', you're on the wrong page! If your issue relates to the Members Area of the website, please contact info@mmoc.org.uk and one of the office staff will come back to you as soon as possible during working hours. If you are contacting us due to a messageboard problem, please contact admin@mmoc.org.uk and I will attempt to get back to you as soon as I have time. Please be aware that this is a volunteer role and I do have a -very- full time job to hold down too, so there is a good chance I might not reply for a day or so. Please don't ring the office staff to try and hurry up the process - the staff there do not have the necessary information to edit or access the messageboard accounts. If you're getting in touch to trace your old Minor, or to offer a car and/or parts for sale, or to ask for some assistance on how to do some job on the Minor, unfortunately it's like that neither I nor the office staff can help - just go to the messageboard and create an account for posting, and ask your question there among people who are able to offer those answers.